Let’s be honest: Every ten-year old knows how to make pasta and I won’t lie to you, the following recipe is not a reinvention of the wheel. However, it might serve as an inspiration to some of you. 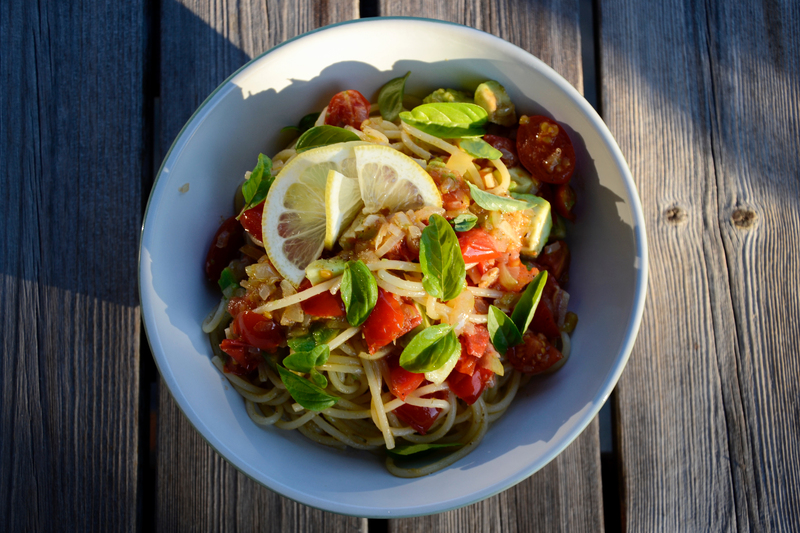 To me, this bowl of pasta embodies summer at its best:The mix of sun-ripened, home-grown tomatoes, freshly picked basil from the garden, garlic, onion, olive oil and some avocado for creaminess makes it taste great, even without parmesan. And trust me, I’m obsessed with parmesan. A few years back, avocados were still considered exotic and many people didn’t even know what avocados are. During the past years, this has changed rapidly: The green fruit full of goodness has become more of a mainstream produce, resulting in an ever rising demand. However, we often forget that avocados travel far before they land in our pasta bowls, salads or even smoothies, thus contributing to our ever growing ecological footprint. We should all be considering this fact when buying fruit or vegetables that don’t grow locally. In a globalized world, it becomes harder and harder to buy locally grown produce with supermarket shelves groaning under the weight of imported goods. Being aware of where our food comes from and how it is being produced is a first step towards a more environmentally and socially sustainable lifestyle (by the way, the lemon for this dish I personally hand-picked from our own lemon tree). Bring water to a boil, add some salt and cook your pasta. Peel and cut the onion into small cubes, do the same with your garlic. Heat some olive oil in a medium-sized pan. Once hot, add the onions and let them cook for a few minutes until soft and golden. Add the garlic. Let cook for a few more minutes. Now add the tomatoes, some herbs de provence as well as salt and pepper to taste. If you feel like you need some more olive oil, go for it. This dish needs quite a lot of it. Also, don’t be too thrifty with the salt and pepper. Once the pasta is perfectly al-dente, strain and add to the pan. Mix thoroughly and let sit for a few moments. In the meantime, cut your avocado in cubes. Add to the pan. Pour your pasta into a bowl and season with some lemon juice and Tabasco. Decorate with fresh basil leaves and a small handful of rocket. I didn’t have any rocket at home but would definitely add it next time. Next > Why is Homophobia Still a Thing Today?